APPLETON, N.Y. -- The next Taste and Paint workshop will be held at The Winery at Marjim Manor on October 14 at 1 PM. For $45, participants receive all the materials, refreshments and a glass of wine for those over 21. Teri Seddon will be the instructor. In about two hours, she will take the participants from blank canvas to finished artwork. 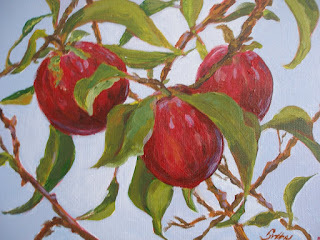 This painting will be of apples on a branch. This class will be repeated on Tuesday, November 13 at 6:30 pm. Reservations are strongly suggested. They can be made on-line at www.MarjimManor.com or by calling the winery at 716-778-7001.